Darius Persian Empire: Cyrus the great ruled Persia from 559-530 B.C. After his death in 530 B.C. Cyrus’s son, Cambyses II took over the throne. In Cambyses’ absence, the throne in Persia is seized by a rebel. On the way home to challenge him, Cambyses dies. So, one of his cousins takes the challenge to kill the impostor. That cousin is Darius. Darius came to the throne in 522 B.C. when the Persian Empire was facing mayhem. 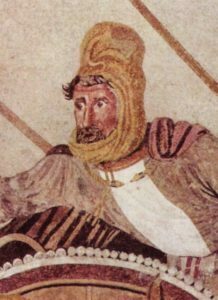 Darius was a remote cousin of Cambyses and Smerdis (sons of Cyrus). On Cambyses death, his brother Smerdis came to the throne. Darius described his victory in the Behistun inscription, in which he presents himself as the faithful servant of the Persian supreme god Ahuramazda. The story of the plot of Darius and six other high-ranking Persians to assassinate Smerdis, who, they pretended, was not the son of Cyrus by that name, but an impostor, a Medean magus posing for Cyrus’ son, who, by their account, had been murdered earlier at the request of his own brother Cambyses, is told by Herodotus in his Histories. Allowed locals to keep customs and religions; divided his empire into districts known as Satrapies; built a system of roads still used today; established a complex postal system; established a network of spies he called the “Eyes and Ears of the King.” he Built two new capital cities, one at Susa and one at Persepolis. In order to expand the Persian empire, Darius brought the provinces of Pakistan under the empire. Capable generals like Mardonius added new countries to the empire, which now extended from Macedonia in the west to Pakistan in the east, and from the river Syr Darya and the Caucasus mountains in the north to the Libyan desert and the Persian Gulf in the south. Darius built a palace in Susa. His empire faced intimidation from the Babylonians, Medes, Carians, Greeks, and Egyptians. Darius Persian Empire was in approval of monarchy. To prevent the monopoly of a single reign, his empire was divided into 20 provinces, where each province was ruled by a governor, called a SATRAP. Their duty was to check law and order in the provinces and also to collect taxes and tributes. He added northwestern India to the Achaemenid realm and initiated two major building projects: the construction of royal buildings at Susa and the creation of the new dynastic center of Persepolis, the buildings of which were decorated by Darius and his successors with stone reliefs and carvings. Some of the sources of revenue for the Persian empire were a trade, agriculture, tribute, etc. Where vassal states would offer their yearly tribute at the festival celebrating the spring equinox. In 333 B.C. 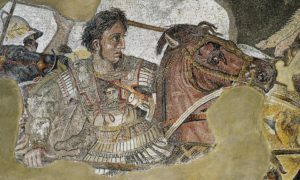 Alexander the Great defeated King Darius III at Issus. Seleucus (one of the generals of Alexander) ruled after the death of Alexander the great.